Columbia University Press, 9780231174824, 360pp. Businesses often find themselves trapped in a competitive dogfight, scratching and clawing for market share with products consumers view as largely undifferentiated. Conventional wisdom suggests that dogfights are to be expected as marketplaces mature, giving rise to the notion that there are "bad" industries where it is unlikely that any company can succeed. But there are notable exceptions in which enlightened executives have changed the rules to grasp the holy grail of business: long-term profitable growth. Rather than joining the dogfights raging within their industry, companies such as Apple, FedEx, and Starbucks have chosen to become metaphorical cats, continuously renewing their distinctive strategies to compete on their own terms. 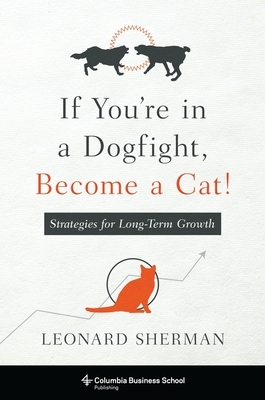 In If You're in a Dogfight, Become a Cat, Leonard Sherman draws on four decades of experience in management consulting, venture capital, and teaching business strategy at Columbia Business School to share practical advice on two of the most vexing issues facing business executives: why is it so hard to achieve long-term profitable growth, and what can companies do to break away from the pack? - What should be the overarching purpose of your business?- Do you really know what your strategy is?- Is there such a thing as a bad industry?- Where do great ideas come from and how do I find them?- What makes products meaningfully different?- What makes and breaks great brands?- How and when should I disrupt my own company?- What are the imperatives to achieving long-term profitable growth? Filled with dozens of illustrative examples of inspiring successes and dispiriting falls from grace, this book provides deep insights on how to become the cat in a dogfight, whether you are a CEO, mid-level manager, aspiring business school student, or curious observer interested in achieving sustained profitable growth. Leonard Sherman is an executive in residence and adjunct professor of marketing and management at the Columbia Business School. He has worked as a senior partner at Accenture, as a managing partner of J.D. Power and Associates, and as a partner at Booz, Allen & Hamilton.